When David and I met and fell in love in Paris in the spring of 1996, we were both in our fifties, established professionals, and parents. He was a divorced American attorney living on a converted barge moored in the center of Paris. I was a clinical and research psychologist working from my home in Westport, Connecticut. Both of us had signed off on loving again. My book chronicles the transatlantic courtship that transformed our internal and external lives as we confronted challenges of kids, careers and cultures and began creating a life together. The memoir describes our synchronistic first encounter and follows us over twenty-three subsequent transatlantic crossings within twenty-two months as we overcome emotional, social, and financial obstacles to being together. Along the way, David the loner, living amid the beauty, freedom and pleasures of Paris, brings me, responsible and overcommitted, back to my core as a woman, while I help him reclaim human connections that tie him to a larger world. We wrestle internal demons (mostly mine) and external threats (mostly friends, family and different perspectives). Rich anecdotes drawn from our moments together bring to life adventures in our separate worlds: mine in Westport and New Haven, Connecticut; Mid-Coast Maine; and Manhattan; at professional meetings held in Banff, Toronto, Washington, Philadelphia and Chicago; and David’s life in Paris, on the Normandy coast, and at weekends with the Harvard Law School Association of Europe in Turin and in Burgundy. Thanks to David’s instinct to save the original documents, the times of frequent but necessary separation are captured in our fanciful and reflective two year fax correspondence, where we both come alive through our own individual voices – flirting, musing, laughing, arguing and whining. We inevitably move more deeply into the shared reality that confronts us both with parts of ourselves that we had long ago buried and that yearned for compassion and psychic space. As our respective needs emerge, we navigate the clutter on our paths and find a way to bridge the geographic distance. Conquering the dual challenges of parenting herself as well as her adult children, Roni Beth Tower lives her transatlantic romance with consciousness and insight, as she decides to leave the safe shore of her home in Connecticut to create a new life with a man she meets in Paris when she is in her early 50’s. Miracle at Midlife is a classic love story set in modern times that draws on the author’s background as a psychologist as well as her wisdom as a woman. It is also a wonderful and moving story that will inspire everyone who reads it. REMARKABLE! Roni Beth Tower starts with that most romantic ideal – an unexpected romantic encounter in Paris – and completely rediscovers and re-creates her own life as a result. In prose both literary and analytic, she glides us through this whirlwind courtship, which upends not only her own life, but those of so many around her: her grown children, her patients, her friends, and of course David, the gentleman in question, and his own family. Throughout this remarkable life transformation, Roni Beth remains a clear-eyed observer of this phenomenal occurrence, the chance for not just love, but a bold new chapter in one’s own life story. A thrilling story from beginning to end, one that reads like a beautiful novel. A wonderful love story, and a pretty good Parisian travel guide, too. In March 1996, Tower, a thrice-married psychologist and mother in her 50s, traveled from Connecticut to Paris and unexpectedly met and fell for David, a successful lawyer of about the same age. Tower writes expansively, honestly, and joyfully about their year of courting over six time zones. It’s full of blissful moments as well as the struggles that come with being part of a couple again after loss, divorces, and years of independence. Theirs was a largely epistolary relationship, and since email wasn’t yet commonplace, much of their communication was by fax and letters. David was American and had sons in the U.S. but had called Paris home for decades, living on a houseboat and adopting a French sensibility. Tower had a very ordered existence in Connecticut, juggling patients, writing articles, and attending conferences while maintaining a full social calendar with her children and friends. In addition, David is the sort of person who wants to drive the car, only sharing his thoughts and feelings when he decides to; Tower is deliberative and analytical and always needs to talk out her feelings. In spite of what looked on paper like a union that wouldn’t work, their connection grew as they happily learned how to fit into each other’s worlds. This is a thoughtful chronicle of taking risks and overcoming fears that offers readers hope of experiencing love later in life. Roni Beth Tower’s Miracle at Midlife transports the reader across time and the Atlantic to the sights, tastes, and heady romance of Paris. Through a meeting of the minds, and with great passion, Roni rebirths herself and finds her soul mate. Her journey is at once moving, humorous, candid, and a gift. Miracle at Midlife, a memoir, tells the inspiring tale of finding love after all hope is lost. Roni Beth and David are far past the point of searching for love, until it finds them. Both struggle with internal demons and threats to their relationship, but their love is a testimony that it is never too late for a second chance at finding true happiness. Romantic and real. A wonderful, thoughtful and inspiring story of love and courage — the kind of tale that teaches us to take chances. And that we CAN overcome our own obstacles. Roni Beth’s story is about the renewal of hope after loss. Together, Roni Beth and David are able to plow through the past, the present, and some of the future, to share their destiny in love. The story itself is that of a classic love story, but set in modern times. It draws on Roni Beth’s background as a psychologist and as a woman herself. A treat to read, perfect for an autumn weekend, curled up on the couch under a cozy blanket with a mug of coffee and some treats. Her journey felt like a dance or a song…Her emotional connections to each aspect of her life were written in such an honest and open way that I couldn’t help but feel that I was right there next to her experiencing it all with her in the moment. Throughout their journey, stories of courage, joy and integrity bring hope and delight to those who wonder how romantic love appears and evolves; inspiration to people in mid-life who, knowingly or unknowingly, have completed a chapter in their lives and are ready to move on; and comfort to anyone who longs to wrestle and conquer the demons of fear, born of history or of the unknown, and win. Testimony that love is real and knows no age limit! A memoir of raw and real romance, David and Roni, both in their fifties had signed off on love – that is, until they meet each other. A transatlantic tale set in Paris and Connecticut, this memoir is uplifting, inspiring and heart-warming. It tells a relatable story about overcoming personal demons and threats, courage, joy and integrity. A romantic autobiography, you’ll love reading this for its emotional honesty. Her background as a psychologist makes Dr. Tower uniquely qualified to reflect on internal experience, interpersonal dynamics, and challenging choices. A passionate midlife love story will appeal to educated members of the Silent Generation, Baby Boomers, and Gen X-ers who came of age before rap music became the default for radio stations and MTV changed our experience of music forever. The National Center for Education Statistics counted over 30% of this portion of the US population in 2012 as college graduates – that is, over 94 million Americans. A smart, insightful, and detailed account of midlife romance. 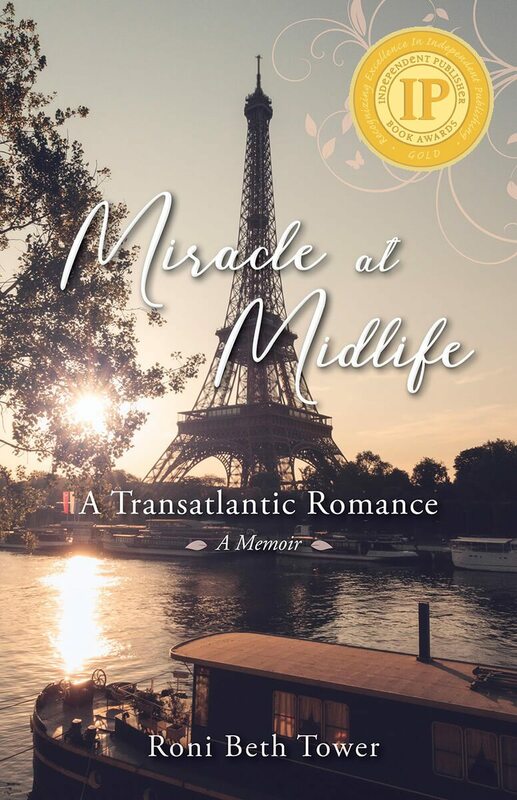 Miracle at Midlife is a captivating memoir of a courageous woman’s physical and emotional journey from Connecticut to Paris, where a new and sometimes challenging love affair awaits. Roni Beth Tower’s vividly detailed story is candid, insightful, and wise about the joys of finding love in middle age, and the resilience required to voyage down new paths to personal fulfillment. She draws on her experience as a clinical psychologist as she describes the passionate attraction that moves both lovers to crucially modify and unite their lives. Tower’s gifts of lyrical language, emotional resonance, and psychological sensitivity combine to offer a memorable narrative about achieving happiness at any age. An inspiring and authentic love story….Through times of joy and hardship, the couple’s pure devotion to each other shines through in Tower’s effectively emotional writing. This moving memoir will bring hope and comfort to those who wonder how romance appears and evolves as we grow older. Roni Beth Tower shares her journey through life with wit, warmth, and insight. Miracle at Midlife is written with an eye for detail and for the ability to make the reader feel like a participant in this adventure. Following a romantic meeting in Paris, the author describes events that involve two continents. Subsequently, she was able to overcome many obstacles, and to reinvent herself as someone open to love and affection. They must have really been in love for all the effort it took to get together. … a wonderful story (that) needed to be told… demonstrates triumph for all of us who aspire, regardless of our age or doubts, and is a reminder… to take life by the coat tails and fly. Miracle at Midlife by Roni Beth Tower is… a testimonial to pursuing a passion, to doing, completing, persevering, and to embracing life. Miracle at Midlife is an honest, thoughtful and authentic memoir about a real love affair, in which the intimacies, conflicts, misunderstandings and resolutions of new love are explored. Roni Beth Tower writes with a compelling command of psychological process and insight, while ably injecting humor in the story of her transatlantic romance. Roni Beth Tower shares a remarkable story about the renewal of hope after loss, and the elegance of destiny in love. Beautifully crafted and narrated, her story will captivate the senses and awaken the reader to the power of living with courage, vulnerability and most of all integrity. What could be more romantic than a vacationing psychologist falling in love with an ex-pat attorney living on a converted barge in the heart of Paris? A page-turner from beginning to end, Roni Beth Tower’s remarkable memoir, Miracle at Midlife: A Transatlantic Romance, offers the reader a chance to experience both the sexual intensity of the romance novel and a clinician’s clear-eyed insights into the difficulties besetting many a cross-cultural relationship. The author would have it that we do not fall in love; rather we remove the obstacles to being in love. And the obstacles are everywhere! From contradictory styles of interaction—she favoring open dialog and shared feelings; he preferring to avoid conflicts, all the better to enjoy the pleasures of the moment, be it a crispy croissant or a glass of vin rouge—to differing styles of parenting adult children and managing complex professional and social lives. This Francophile couldn’t put it down. Highly recommended. Roni Beth’s story is about the renewal of hope after loss. Together, Roni Beth and David are able to plow through the past, the present, and some of the future, to share their destiny in love. The story itself is that of a classic love story, but set in modern times. It draws on Roni Beth’s background as a psychologist and as a woman herself. Roni Beth and David’s journey reveals their story of courage, joy and integrity while bringing hope to those who haven’t learned of romance and love. The testimony of this book shows readers the simple fact that love is real and possible, no matter how old (or young) you are! The author shares her love story with such honesty and sincerity that it will truly inspire readers who are struggling with their own love story, regardless of your age or your doubts! An insightful and introspective account. …makes you think about how one person that you meet on the street could become your soul mate, it’s truly the perfect love story. You could feel the emotions from Roni Beth from the time she meet David to where their future was headed. This book goes to prove that you have to take that leap of faith in order to find true love!! This book shows you that no matter what your age, background or geographic location love can find you in the most surprising places. Many themes throughout this sweet love story: hope, courage, loss and renewal. I enjoyed their story and happy they found happiness. This well-written memoir reinforces the concept that it’s never too late to find love and love does conquer all! An excellent choice for a book club selection; many discussion points and real life conflicts to appeal to a variety of readers. Robin: …one of the things we learn from your book, we learn that we as individuals can survive but it really is most incredible to share life with a partner. Larry: It’s a wonderful book, a movie in word form.